I’d like to start a book club and read one food-related book every two months. In the future, we’ll work together to choose a title, but I’d like to propose Free For All: Fixing School Food in America for our first book title. I bought this book back in February and then I ran out of time to read it. If there is one book I should read (and probably know by heart), I think it should be this book. The author, Janet Poppendieck, contributed a guest blog post last year, which I was reminded of when she recently appeared on The Lunch Tray blog as well as writing a piece in The Washington Post. 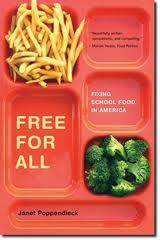 Then Free For All: Fixing School Food appeared on Grist’s Favorite Books of 2010. It seemed like a logical choice. After the holidays we’re all strapped for cas,h so don’t feel like you have to plop down some more money on something new. The paperback version of the book comes out on January 3rd, which is a little cheaper, but you can always go to your local library and check out the title. If they don’t have it at the library, you can ask to have it interlibrary loaned from a partner library. In college, I worked in the interlibrary loan (ILL)department of the massive, main library so I’m a big fan of ILL and what it does. We’ll spend the month of January reading the book (and acquiring it if you don’t have it), then in February I’ll post discussion questions once a week. We’re in a unique position, one that I’ve never been in before: I have a way of contacting the author and asking follow-up questions if we have any. At the end of February, we’ll have Twitter and Facebook chats about our thoughts on the book and the outlook for school lunches based upon what we have learned. Oh, what a great idea! I'll have to see if there is a kindle version of this book. Oddly enough, I'll read it electronically faster than I would a hardcopy! Looking forward to Twitter comments as I am not on Facebook! Sounds like a terrific idea! And yes, there is a Kindle version—$14.00. A little pricey so I may check the library first but will probably end up downloading the Kindle version!!! I also think this is a wonderful idea. Will you also have comments here as I do not have Facebook or Twitter. I'm in if Amazon will oblige me, Twitter I'm a go for, but facebook, no can do. Great idea. Been meaning to read this book too. Will do my best to participate. Thank you. Incidentally, this story just came out in today's newspaper regarding sugary milk in school. I like the idea of reducing the flavoring/sugars in milk and still giving them to the kids. I really like the idea of the Department of agriculture being in charge of school lunches. Imagine all the wonderful fresh produce that won't lose nutrients due to transportation. Think of the money that can stay in the state! i look forward to participating in this as I greatly appreciate a 2 month window which is more realistic for working (or full time school) adults. 🙂 Yeah! Will you add a forum for discussion or just use this blog as a discussion board? Very cool! Love it – especially the timing! Super excited to read this book. OMG Mrs. Q – I love this idea! I have been wanting to read this book since Amazon had it on pre-order, and it has just never made it to the top of my list. It's there now! Can't wait to discuss here in your blog and on Facebook. Happy reading! I hate to be the bearer of bad tidings, but you promised you would "out" yourself when the project was over. When are you going to dilvulge your plans for revealing your identity? Not that I mind these latest posts about wrapping gifts and tomato soup, but I am eagerly awaiting this final step in your project. It's been a long and amazing journey. I'm in for the book reading, great idea…we will all be "on the same page" prepared to fight the battle of the lunch wars for our children! sounds like a great idea! will get when the paperback comes out. (our library is closed for renovation – bummer) will look for you on facebook. Great idea, Mrs. Q! And, as you know, Jan is very responsive to questions, if we have any. Looking forward to it. Yeah, this should be fun! Anonymous, regarding a reveal, it's in the works. My coworker read it and said it was great, but gave her copy to a dietitian at the local hospital. Apparently it's necessary reading for everyone involved with school food. Late jumping in to comment on this post but I got a copy of Free for All from my sister the gastronomy grad student over the weekend and I'm THRILLED to be able to read along. Mrs. Q, you are doing crucial work – keep it up!